France has many beautiful carp fishing spots. One of them is Grand Lac de Laffrey near Grenoble. This public lake is located just below an altitude of 900 meters. This magnificent public water in the south-east of France is known for its high average catch weight. 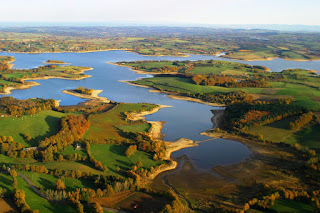 For those looking for a unique carp fishing location in France the Grand Lac de Laffrey is highly recommended. It's a long drive, with a distance that can be compared to a skiing holiday location in the French Alps, but the trip is worth it! With its 132 hectares Grand Lac de Laffrey, which is about 20 kilometers beneath Grenoble, is the ninth largest natural lake in France. This meltwater mountain lake, known for its very clear water, is unique as it is situated at an altitude of 900 meters. And there are enough fishing spots with a total length of three kilometers and an average width of 500 meters over that length. Like many other glacier lakes the differences in depth are rather extreme, with very varying soil and a maximum depth of 39 meters for Grand lac de Laffrey. Grand Lac de Laffrey has a nice stock with generally very good catch results. That in itself is a special thing because of the high altitude, and large temperature differences between the seasons. In summer the water is over 20 degrees celsius, while in winter the lake is frozen to -20 degrees. That catches are good, according to experts due to the abundant natural food in the lake, which has produced some very beautiful and large carp. There is a nice balance between common and mirror carp, which are known for their enormous fighting spirit. The average catch weight for Lac Laffrey is 11 kg, with a lot of reports of carp between 18 and 20 kilograms and a record fish of around 25 kg. Interestingly, however, that the catches of carp between 15 and 20 kg are very numerous. A weeklong fishing session on this lake will most likely produce at least a thirty pounder, with, of course, always the possibility of a real heavy specimen of more than 20 kilos. Night fishing is allowed on Grand Lac de Laffrey, as is the use of (food) boats. Obviously, a license is required for fishing in this beautiful water. For France the online license can be obtained easily online, using the government website of cartedepeche. For more information you can also look on the website of the local fishing association. They are responsible for fishing on Lac de Laffrey. Below is a video that gives a good idea of this beautiful public water.